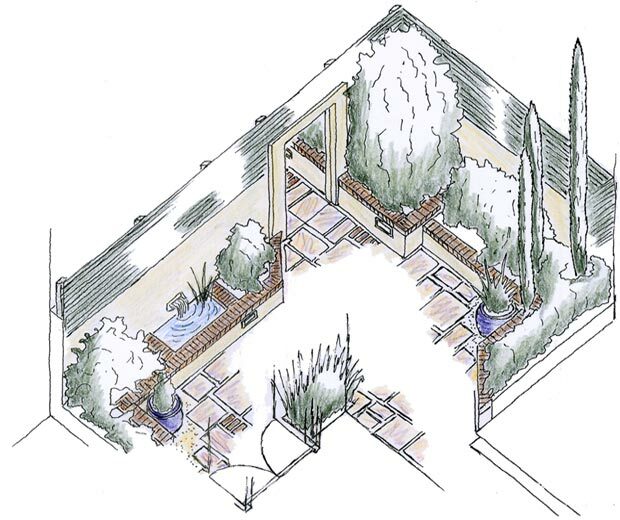 A perspective drawing of this small, shaded courtyard in Dublin was first created to meet the client brief of increasing light and generating a sense of space, while also ensuring a low maintenance garden. 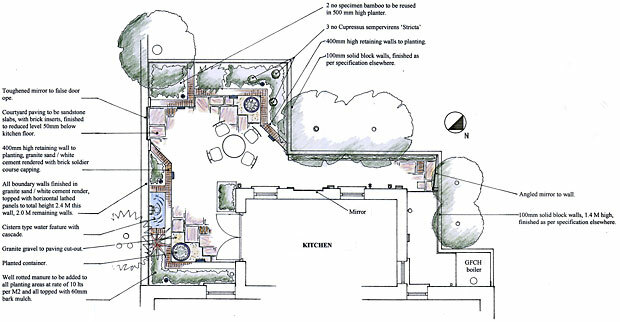 Drawing of a courtyard garden design showing the use of mirror as trompe-l’oei. The design of this courtyard uses level changes and horizontal lathed fence panels coupled with mirrors and architectural planting to maximize the sense of space. 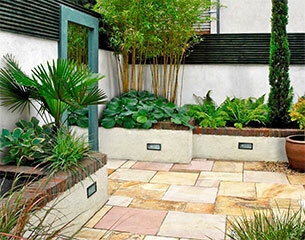 The rich colour of the sandstone paving and brick cappings provide warmth to this small courtyard garden. 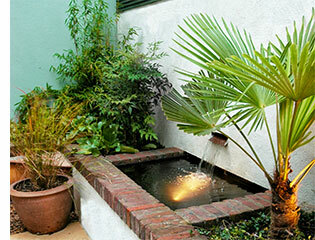 The focal point water feature is framed by carefully selected architectural planting. 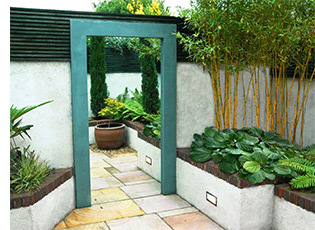 The design plan is simple, low maintenance and uncluttered with every plant chosen for greatest impact, while the use of richly coloured finishes adds warmth to what could otherwise be an uninviting space. The cistern type water feature provides movement and soothing sound to the courtyard, and also acts as a strong focal point when viewed from the kitchen. Detailed concept plans are produced as part of the design process. The mirrors are positioned to create a false perspective, or trompe l’oeil, giving a sense of space beyond the boundaries of this small courtyard. Careful positioning of the mirrors reflect the garden, rather than the viewer, thereby increasing the impact of this feature. 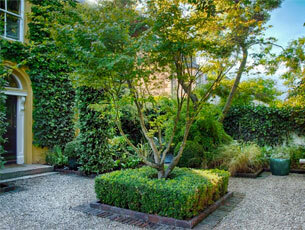 The formal front courtyard, and the use of mirror to create a sense of space in the rear courtyard.